January 8: Lakes Area Tea Party meeting features an 11th Congressional District Candidate Forum (with four of the five announced candidates confirmed) at the Novi Emagine Theater from 7:00 p.m. to 8:30 p.m.
Today begins 2018 and we are so blessed to live in the best country on the planet. Let me be among the first to wish you and your family a HAPPY NEW YEAR! Republicans believe 2017 was an awesome year! President Trump has rolled back federal regulations, slashed our taxes (THANK YOU DONALD!) and has shown the way to restore freedoms reduced over the prior eight years, appointed a supherb Justice to the Supreme Court and the list goes on and on. We are blessed to live in a GREAT country. Our 3rd annual Christmas/Hanukkah party was the best yet! For those who could attend, you know what I mean. For those who could not attend, make a New Year Resolution to be there in 2018!! “Kris & Mike”, our emcees for the night, Kristina Karamo (District activist) and Mike Parr (Southfield) did an excellent job to keep the event moving and did a great job. The Silent Auction, Card Draw, centerpieces donated the Michigan Democrat Party (yes there is a awesome story here) and your generous bidding allowed us to raise significant funds for the 14th CD to use in the 2018 election cycle. Without these amazing sponsors, our event would have never been as successful as it was. Never. Please thank them whenever you can! More thanks are in order to the Fundraiser Committee! The Committee was chaired by Carol Foster (West Bloomfield), with key roles by Cheryl Constantino (Harper Woods) who organized the silent auction, and Terry Poplawski (another District activist) who donated and set up all of the decorations. Special thanks to Christina Barr (Pontiac) and her sister who sang for us. WIthout all these volunteers the event would not have been the artistic and financial success that it was. Other committee members who worked, contributed and/or donated to the silent auction include Aaron Tobin, Jay & Carol Hackelman, John Danielle, Matt & Tina Seely, and Bill Rauwerdink. Great work TEAM! Details of the financial results will be reported at our January meeting, but it safe to say this was the single best fundraiser ever held by the 14th District. It was a festive way to kick off the Holiday season! Pictures from this #MAGA event are on Facebook at https://www.facebook.com/mi14gop ! After we all get settled in after too much holiday nog, too many football games and are back on our diet we quickly come upon a very significant national holiday. January 15, 2018 will mark M. L. King Day. Dr. King’s message of nonviolent protest to achieve some incredibly significant accomplishments might, today, we unwelcome. Protesters today seem bent on violent intolerance to draw attention to themselves and not to obtain the actual “goals” (which are often unclear to start with). So take a moment on this day to remember Dr. M.L. King! The December MRP State Committee meeting was important for the 14th. One of our State Committee members, Christina Barr, was elected to the position of Vice Chair-Coalitions for the Michigan Republican Party. This is statewide position, so congratulations to Christina. Her election means that the District now has a vacancy on State Committee because Christina can not serve in both capacities. We will have an election at the January meeting after SOS candidate Mary Treder-Lang speaks. Are you a member of the Republican 14th Congressional District? Want to join the 14th District? Each year we get asked “are your dues paid?”. To help you get this task crossed off your list, we are hosting a membership drive starting now and through February. Snail mail your $25 membership check mailed c/o 14th District Treasurer, 2630 Birch Harbor Lane, West Bloomfield, MI. 48324 (checks made payable to the 14th District). 2017 List of Paid Memberships: Ann Capela, Jay Hackelman, Renee Strobl, Barry Berk, Robert Oestreich, William Rauwerdink, Carol Foster, Matt & Tina Seely, Kristina Karamo, Sue Burstein Kahn, Ed Kohl, Cecelia Russell, Terry Poplawski, Marlene Miller, James Klock, Carman Klock, Cheryl Costantino, Ken Chadwell, Don Pevin, Marc Corcoran, John Zupanc, Linda Stulberg, Carol Foster, Janine Kateff, Robert Steele, Irving Ginsberg, and Don Perry. 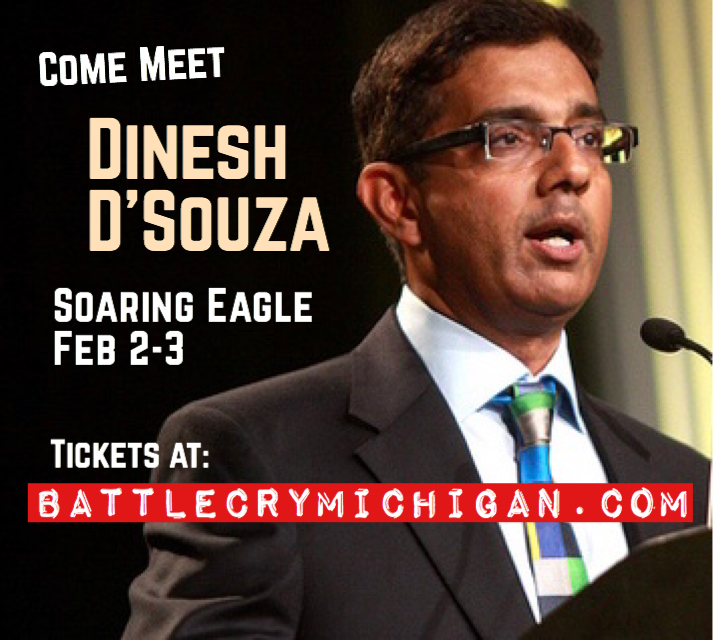 D’Souza will speak at Battle Cry ’18, an event now in its third year, the largest gathering of conservatives in the midwest, is sponsored by the Michigan Conservative Coalition. MCC notes that this is also the largest gathering of Michigan’s elected Precinct Delegates, other than at MRP’s statewide conventions. This year the Battle Cry theme is “Can You Hear Us Now”. Another featured speaker will be grassroots leader and activist Paul Nehlen, who is seeking to unseat Paul Ryan (R - WI). Nehlen seeks election to be 100% on board with the Trump agenda and help “drain the swamp”. Click here to learn more. Your Trump bashing continues on the news pages rather than the opinion pages where opinions belong and further demeans the integrity of a once great newspaper. In your November 29 “GOP shoves tax overhaul ahead” article you mention “Corker, who's all but broken with Trump over the president's behavior in office” – what “behavior in office”?? Where were your “Obama’s behavior in office” with his $150B gift to Iran, Benghazi failure, ignored “Red Lines”, immigration failures, etc? You did not because your agenda is to destroy the Donald Trump administration. Though we thanked all donors earlier to recognize their role in making our Christmas/Hanukkah party such an important success, one type of donor needs extra recognition. They will get it that recognition here! All but a handful for donors were candidates who really seek our vote and/or endorsement. That is awesome to help keep our Republican principles alive in office. The 14th District’s podcast project is taking the needed steps toward launch in 2018. The podcast will focus on growing the Republican “brand” and will deliver the Republican messages to podcast listeners, who often are often younger voters. The podcast series will launch in 2018 as the team clears various technical and legal issues. Congratulations to Mike Parr (Executive Committee member from Southfield) and Kristina Karamo (District activist) for leading this effort. House Resolution 71 (Wyden Amendment) failed 47 to 52 with Stabenow voting FOR. This was to amend a budget resolution to delete language that would allow Congress to pass tax reform using an easier legislative process that avoids a Senate filibuster. House Resolution 71 (Baldwin Amendment) failed 47 to 51 with Stabenow voting FOR. This was to amend a budget bill to prohibit any tax cut that uses its baseline numbers, if officials say this would increase a deficit or reduce a budget surplus. House Joint Resolution 111 passed 50 to 50 (with Pence breaking a tie vote) with Stabenow voting AGAINST. This would overturn a CFPB (a/k/a bureaucratic) regulation that mandates companies to write binding arbitration agreements in such a way as to make it easier for lawyers to bring class action lawsuits. Huh? Why would she support class action lawsuits? House Resolution 71 (Paul Amendment) failed 33 to 66 with Stabenow voting AGAINST. This was to amend a budget bill to allow Congress to repeal the ACA (a/k/a Obamacare) using an easier legislative process that is not subject to a Senate filibuster. House Resolution 71 (Lee Amendment) failed 49 to 51 with Stabenow voting AGAINST. This would have prohibited the federal government from regulating endangered species that exist entirely in one state and do not cross state lines. The feds LOVE to regulate things. House Resolution 71 (Heitkamp Amendment) failed 47 to 51 with Stabenow voting FOR. This was to make future legislation more difficult to increase taxes on taxpayers who have an income under $250,000 annually. Someone needs to pay taxes. Senate Motion 255 passed 55 to 43 with Stabenow voting AGAINST. This was to confirm Notre Dame law professor Amy Coney Barrett as a judge for the Court of Appeals for the Seventh Circuit. Senate Motion 257 passed 60 to 38 with Stabenow voting FOR. This was to confirm Michigan Supreme Court Judge Joan Larsen as a judge for the Court of Appeals for the Sixth Circuit. Apparently Stabenow needs some votes in Michigan to be re-elected. Senate Motion 261 passed 53 to 43 with Stabenow voting AGAINST. This was to confirm Stephanos Bibas as a judge for the Court of Appeals for the Third Circuit. Senate Motion 259 passed 56 to 41 with Stabenow voting AGAINST. This was to confirm Allison Eid as a judge for the Court of Appeals for the Tenth Circuit. Senate Motion 277 passed 54 to 43 with Stabenow voting AGAINST. This was to confirm Joseph Otting as Comptroller of the Currency.